Microsoft Response Point, is Microsoft's foray into the SMB phone system space, offering companies of up to 50 employees to easily set up and maintain an IP-PBX with advanced functionality such as speech recognition dialing and voicemail-to-email - all at an affordable price. Response Point, which was developed under the code name 'Edinburgh', is being sold as embedded software within digital phones manufactured by Microsoft hardware partners D-Link, Quanta Syspine, and Uniden Evolo. Aastra also plans on offering a Response Point system sometime in 2008. Inevitably, Response Point will be compared by some against its big brother Office Communications Server 2007. You can read my take on that comparison here. In brief, I wrote, "My take on Response Point is that it really is designed for the SMB looking for a nice turnkey solution with cool productivity enhancements, such as speech-rec –BUT without the need for all the baggage that OCS 2007 carries – Active Directory, Exchange Server 2007, DNS server, etc. Someone deploying OCS 2007 has a lot of pre-requisites to install – a bit hairy for many in the SMB space – not just the complexity, but the license costs as well." So they are indeed two different animals. I should also point out that OCS 2007 is not an IP-PBX - it is used as an adjunct to an existing IP-PBX, where as Response Point is a full-fledge IP phone system. In any event, Response Point runs on Windows XP Embedded using 100% solid-state memory - no hard drive - so it has no moving parts and therefore has better reliability. Microsoft came to TMC's offices to demonstrate Response Point and to leave the unit for me to test. Microsoft came with the Quanta Syspine model which features embedded FXO trunk ports for connecting up to 8 analog lines. The D-Link model took a different approach by instead using external analog telephone adaptors (ATAs) for connecting analog lines. The D-Link DVG-3104MS is a 4-port FXO VoIP gateway and you can simply stack two together to give you the same 8 ports offered by the Syspine model. The nice thing about this approach is that you can scale as few as 4 analog lines and keep adding more as needed up to a maximum of 50 analog lines. The drawback of course is that you will need network cables run to each FXO gateway, and separate AC adapters to each unit, which will use more electricity. Once you go past 15 analog lines you are probably better off going with a T1 line. Speaking of T1, unfortunately, Response Point doesn't currently support a T1 card in the base unit or within an external T1 gateway. In theory, you could purchase a T1-to-analog gateway to covert the digital T1 signal into analog lines and connect the analog lines to multiple D-Link DVG-3104MS gateways. But that sort of defeats the purpose of a high-quality digital T1 when you convert it to analog. Most SMBs use analog anyway, but an upgrade path to T1 via integrated T1 support should be offered in a future Response Point release. Since the phones, base unit, and the FXO adapters all use virtually the same Response Point software (with some customization), you can mix-and-match components across model brands. For instance, you could add a D-Link DVG-3104MS 4-port gateway to the Quanta Syspine (8-port) if you want to expand it to 12 ports. Or you could add D-Link phones to the Syspine unit. Though most customers would likely stick with whatever hardware their VAR/reseller initially sold to them. Although Microsoft demoed the system, I also hooked it up in my lab to see how easy it was to install and configure. My experiences are a mix of the two installations. The first installation duplicated the "out of box" experience any customer, VAR, or reseller would have. Microsoft and I connected the main Syspine Response Point unit along with three Syspine IP phones to a Microsoft-provided D-Link switch (ironic considering D-Link offers a competing Response Point). Next, we powered on the Syspine Response Point unit and finally we powered on the three IP phones. 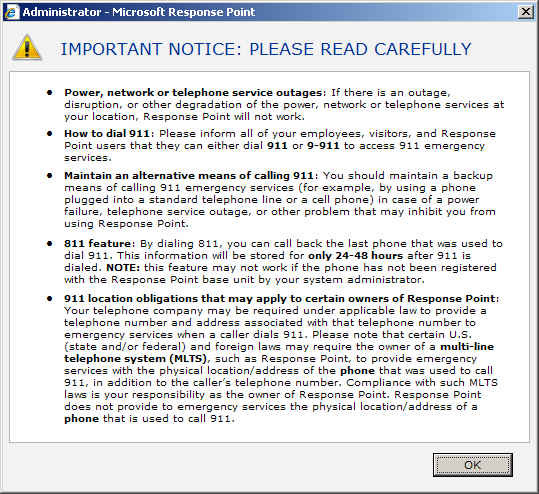 The Response Point main unit took about 88s to boot the Windows XP Embedded operating system. Next, I installed the Microsoft Response Point Administrator and Assistant (softphone-like tool) via the CD, as shown below. Another popup came up prompting to install a certificate on the admin PC (used for secure TLS connection). The next step was adding the phones and assigning them to users. However in Response Point, a user can also be a job role, such as Receptionist, a location (kitchen, warehouse), or a group (Sales). 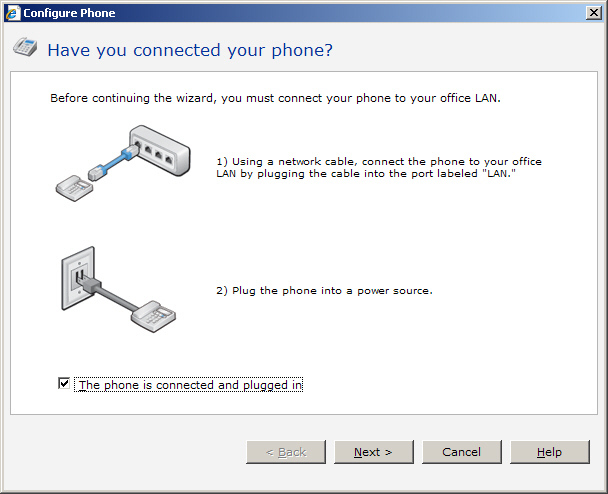 Multiple users can be assigned to a single phone and an individual user can be assigned to multiple phones. However, each user is given a unique extension. The extension number identifies the user, whether that user is a person, job role, location, or group. 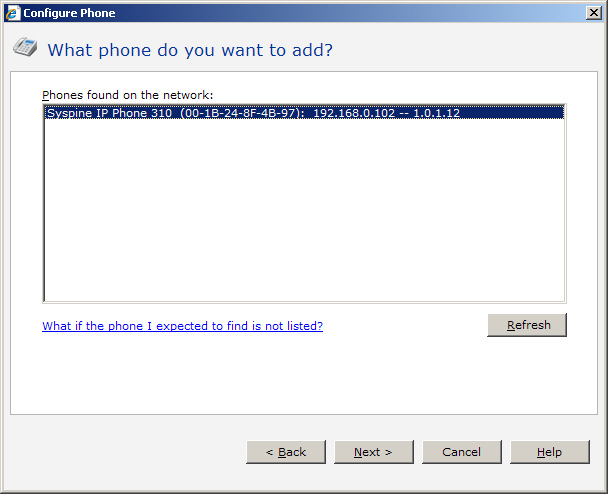 Here you see the software automatically detecting NEW IP phones on the network to be added. Phones already added won't display. After selecting which phone to add (in this case we only have 1 new phone on the network), we assigned the Primary User to Richard Sprague. Each phone can also be assigned with up to 3 shared users and this single phone will ring with up to 4 different extensions assigned. Fortunately, you can tell which extension is being dialed since the extension number is displayed on the phone's LCD. So if it is indeed a truly "shared" phone, you'll know if the call is for you or someone else. You can also ring multiple phones. For instance, you can create a Sales Group and assign multiple extensions to the Sales Group and all of their phones will simultaneously ring. Alas, no round-robin type support. After adding this phone (along with 2 other phones) we then added some users via the main user interface in Administrator. Adding a user is very easy. The properties/settings for a user is very similar both from the Administrator program and the Assistant program, which I'll discuss in a bit. As seen by this screenshot you can enter the first and last name and up to two nicknames. The nicknames are useful since you can spell out difficult to pronounce names phonetically to ensure the speech recognition accurately detects a person's name. You can also use nicknames for alternative names like "Thomas" vs. "Tom" or "William" vs. "Bill" vs. "Billy". When I dialed any of the users by name amazingly the speech recognition had 100% accuracy and didn't make a single mistake. Another feature available here is the ability to record your name instead of using the text-to-speech (TTS) to say your name. Surpringly the TTS was pretty good, so I think some Response Point customers may even choose to leave the TTS voice as the default. 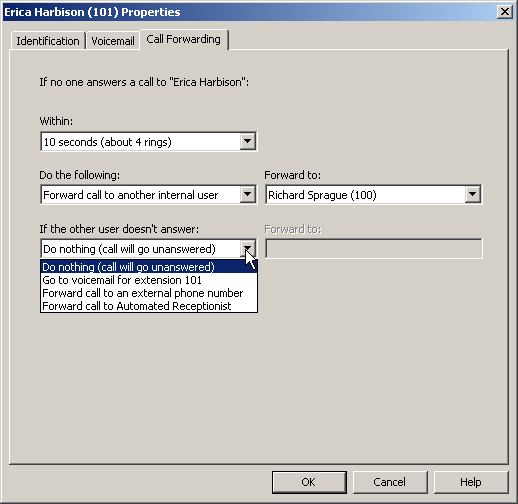 Here's an interesting tab that lets you define call forwarding rules. After a specified number of rings you can have the call forwarded to another internal user, sent back to the automated receptionist, or even have the call forwarded to an external number, such as your cell phone. The Administrator program gives you an "overview" status of the unit including available voicemail storage and any unviewed errors. 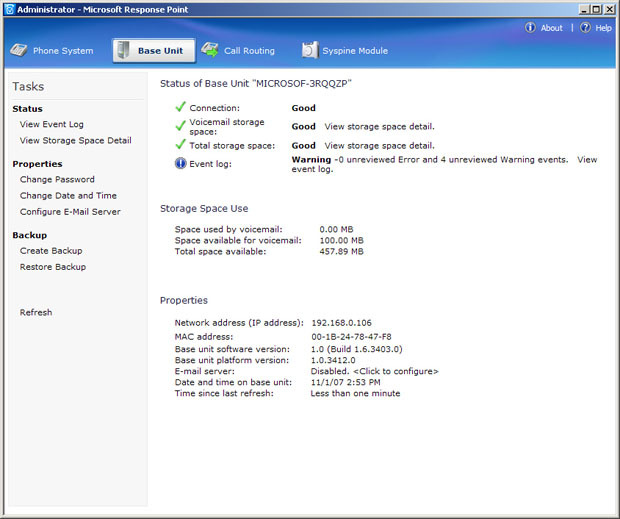 You can also get more detail by clicking 'Storage Space Detail' to see which users are utilizing the most storage. Most people would opt for the automated receptionist, however some smaller organizations prefer the "personal touch" of a human being always answering the phone. Of course, if you use the "Receptionist Plan" you lose the ability for callers to simply speak the name of your employees and have the call routed. Keep in mind that the "Receptionist Plan" can be setup to ring multiple phones simply by assigning multiple phones to a specific user. 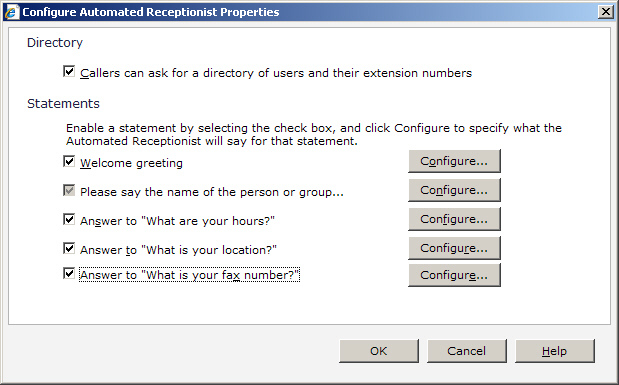 Besides the ability to dial your employees by name, the automated receptionist has some other cool built-in features. For instance, you can record answers to common caller questions such as "what are you office hours? ", "what is your location", and "what is your fax number". These are all common questions that would have had to be answered by a receptionist but can now be handled automatically using the caller's speech. This leaves the receptionist to handle more complex phone queries and increases productivity. I tested these automated speech-rec functions and they worked flawlessly. My only complaint is that the questions are statically defined. I wish I could define my own custom questions and record the corresponding responses. Optionally, you can configure a SMTP e-mail server for sending voice messages as e-mail attachments. It was pretty easy to configure and is becoming a "must have" feature for any advanced IP-PBX phone system. There is no direct Microsoft Exchange Server integration (only SMTP support), so if you delete the email in Outlook, it won't also delete it from the voicemail system. However, the Response Point product is designed to work in offices that don’t have any IT infrastructure and therefore typically do not have Exchange Server deployed. Having your voicemail in your email is certainly a feature that SMBs have been clamoring for so Response Point certainly delivers this at a price that is often very expensive in other solutions. Each user has the ability from the Assistant softphone application to define their own Contacts with up to 3 different numbers, which can also bypass the Automated Receptionist based on the CallerID. 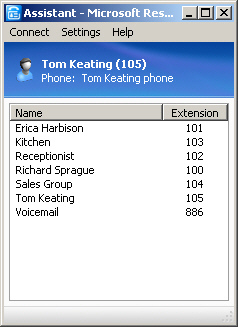 You can also import your Outlook contacts or Windows Address Book with a maximum of 1100 contacts. But it gets better. You can configure a cool External Access feature with special access to pre-programmed phone numbers that essentially lets you dial into Response Point and then allow you to perform all of the advanced speech-recognition functionality that you can do if you were in the office. More on this feature in just a bit. After installing all the phones and configuring the various options on the base unit I proceeded to test the various features. First off, I launched the Assistant program. Compared to some softphone applications I've seen it's a very simplistic application that merely lists the corporate directory and lets you configure your personal settings such as voicemail, call forwarding rules, nickname(s), and adding or importing contacts. It also shows a Toast popup in the lower right during an incoming call, which will display the CallerID and name. Unfortunately, you can't click-to-dial anyone in your corporate directory to initiate a call, transfer, or conference. Of course, Microsoft's plan is to leverage speech recognition for the "ease of use" and not a "true" softphone application. In fact, Microsoft pointed out to me that many users are still afraid to transfer a call and often preface a transfer with "If I lose you, I'll call you back". Using the Response Point button on the phone employees can press one button, wait for the chime, and then simply by issuing verbal commands to access anyone in the company directory, including anyone imported via their Outlook contacts. I couldn't help but reminded of the Staples Easy Button. Simply pressing the Response Point button to initiate a transfer using speech recognition makes it very easy to use and instills confidence in the user. When I tested this feature, it worked flawlessly every time even when I tried to trip it up by varying how I asked to transfer the call. Response Point's speech recognition is very flexible, allowing you to vary what you or your customers say and it will still understand the semantic meaning of what you are asking. For instance, you can say "Transfer to Tom" or "Transfer call to Tom" or "Transfer call to Tom Keating". Surprisingly, I did notice that you can't initiate a conference using speech recognition, which seems like an obvious feature. People have more problems initiating a 3-way conference than a transfer. Now back to the External Access feature I mentioned earlier. After defining my outside line's CallerID number as "allowed" to have external access, I dialed into the Response Point system from this outside line. The automated attendant detected the CallerID and immediately prompted me to enter my PIN. I tried entering my PIN using speech, but it requires touch-tones. Bummer if you're driving and using a Bluetooth headset. Anyway, after entering my PIN it played the Response Point chime and I could now issue "some" of the Response Point verbal commands that I could do directly on the Syspine phones. So for example, I could call any of my Outlook contacts by saying "Call Bill Gates" (me and Bill go way back ;) ) and it will initiate an outbound call to Bill's phone number. You can even get specific by saying "Call Bill Gates mobile number" since it allows up to 3 defined numbers. If you forget the available commands you can simply ask, "what can i say?" When issuing the "what can I say?" command from an external phone line, it says "To place a call say the name of the employee or the name of the personal contact, say transfer to transfer a parked call, or say retrieve to retrieve a parked call". I was able to call contacts and employees simple by saying their name, however transferring a parked call or retrieving a parked call didn't work. The other two cause the system to say "Sorry that feature is not available on an external phone." Obviously, there is no reason to transfer or retrieve a parked call externally, so these options should be removed from the help prompt. Missing from the help prompt is the ability to retrieve voicemail simply by saying "voicemail". Minor issues for sure and I'm sure a quick and easy firmware fix. The Syspine phones themselves were pretty good. The button layout was very easy to read and it includes a voicemail button that illuminates red when you have voicemail waiting. The LCD was easy to read and will even display CallerID name if available. I tested what would happen if you are on an extension-to-extension call and the Syspine base unit was rebooted. As long as the call was connected already, the call stays up, as it should. 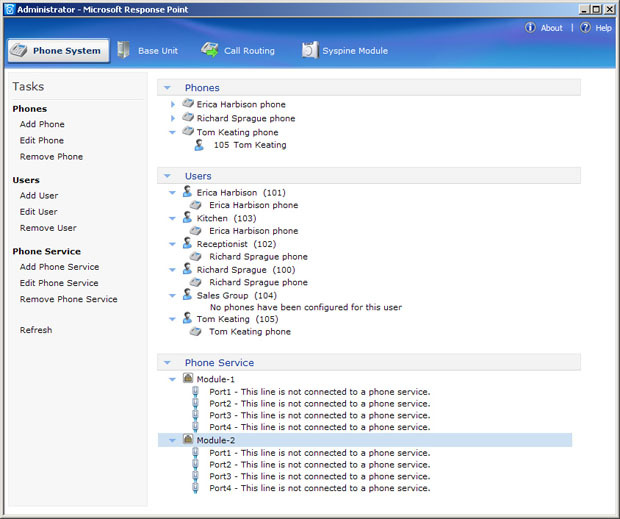 The base unit should only perform the call setup and then the phones are peer-to-peer (P2P) once connected. 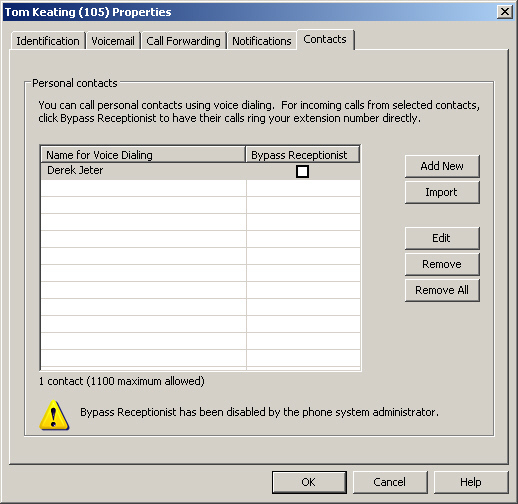 However, any other user trying to initiate an extension-to-extension call will fail until the Syspine unit boots up. It would be nice if the phones maintained an "internal extension lookup table" for internal dialing while the Syspine unit is booting or being replaced due to failure. This way at least internal calls work. Speaking of redundancy, Response Point features a 2-click Backup & Restore feature. 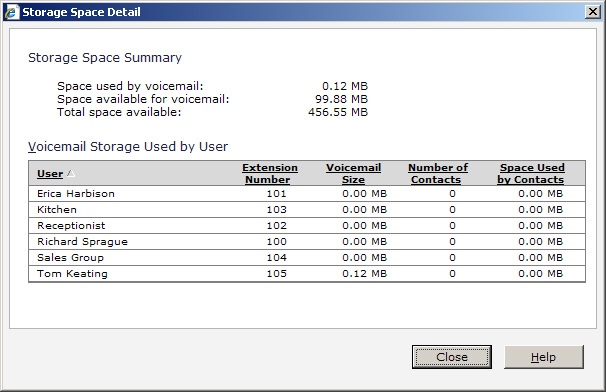 When you backup the unit to a file on your PC, it takes literally seconds (depending on the amount of voicemail). Then you can replace your unit, click the Restore button and browse to the file you backed up and be back up-and-running to the exact state when the backup was executed. This is a really nice feature and easy enough for the SMB to manage. Parking is a nice feature that works really well. If there is only one parked call, you can quickly retrieve it simply by going to another phone, pressing the RP button and saying "retrieve parked call". If multiple parked calls, it will tell you the parked location and then you can retrieve that specific parked location. It's worth mentioning that Microsoft Response Point uses Transport Layer Security (TLS) to encrypt traffic for secure communications. One of the key advantages is that you can all the features and add phones or extensions without paying additional licensing fees. A nice feature is the ability to set your phone to forward to another user, but if unanswered, the voicemail is left on your voicemail. 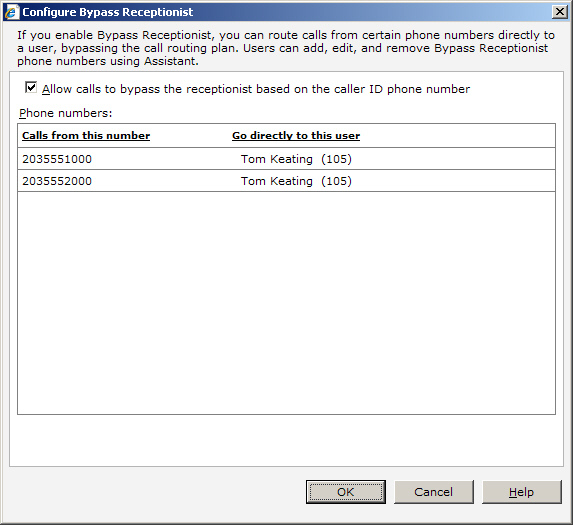 You can also set calls to forward to an outbound number, such as your mobile phone number. When asked about SIP trunking support, Microsoft stated they plan to support it and have been working with Broadsoft, an Internet Telephony Service Provider (ITSP) to offer that in a future release. They want it to be as plug-and-play as possible by having the SIP settings preconfigured for each of the partner ITSPs. 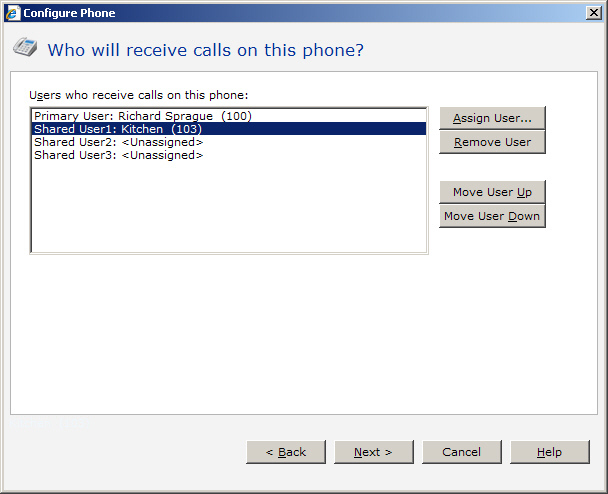 I did notice there is no call log in the software attendant softphone, nor does it save outbound, inbound or missed calls to Outlook. OCS 2007 pushes out an email to the Conversation History folder due to direct Exchange integration. Response Point doesn't have direct Exchange integration, but it can connect with any SMTP server, which it currently uses to forward voicemail messages. So Response Point could in theory send an email containing the CallerID information for any inbound call you answered or an inbound call you missed, as well as the phone digits dialed for any outbound call. Of course, receiving an email for inbound calls, missed inbound calls, and outbound calls could quickly fill your Inbox. Perhaps it could be user configurable so that only missed calls initiate an email. This is important to sales people that are expecting a call from someone and the person doesn't bother leaving voicemail. That said, the Syspine phones I tested did support Call History on the phones themselves, including missed, received, and dialed calls. Currently, the Music On Hold (MOH) is statically defined in the firmware by the OEM manufacturer and cannot be changed. It would be nice if the MOH could be customizable to support .wav or .mp3 files. The voicemail system was decent but I wish it has the ability to screen the caller's name allowing the user to accept or reject the call accordingly. Similarly, I wish it had the capability of voicemail call screening so you can pull callers out of voicemail. 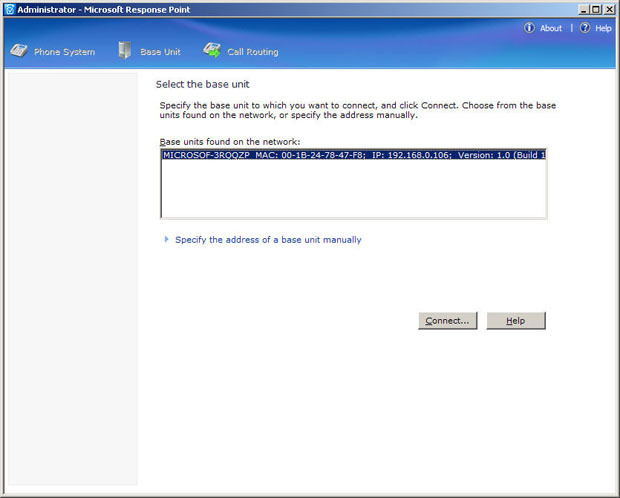 Response Point doesn't have the ability for remote IP phones to connect to the base unit via your home broadband connection. The IP phones have to be on the same subnet. Microsoft told me the reason why they did this was to avoid complexities due to NAT/firewall issues. Most SMBs don't require remote phone capabilities, so this is not a big deal for most, but I thought it worth mentioning. Response Point doesn't have ACD queuing for callers to wait in queue, but this is a feature you don't typically see in the SMB. Although this is a somewhat long list of RFIs, Response Point has all of the main features you need to be productive in your phone communications. Most of these "room for improvement" features are for advanced users like myself that want features above and beyond the norm. • Additional Quanta phones are $159; D-Link will sell additional phones for approximately $139. • The Quanta Syspine package includes a base unit with an integrated secure gateway and eight phone-line ATA, both built in, and four desktop phones for approximately $2,500. • The D-Link VoiceCenter package includes a base unit, a four phone-line analog telephone adapter and five desktop phones for approximately $2,500. A 20-phone D-Link Quanta system (15 additional) would be $4585. 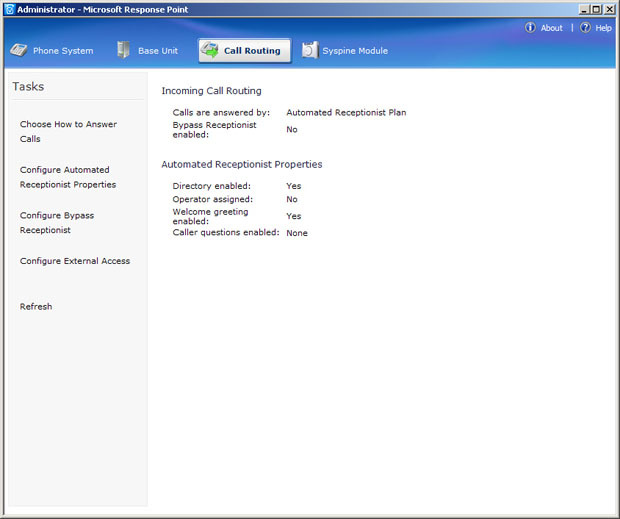 Microsoft's goal was to create a turnkey, plug-and-play IP-PBX for small-to-medium businesses that is not only easy to install, but is easy to manage and more importantly adds sophisticated functionality such as speech-rec dialing, call forwarding, and voicemail-to-email usually only seen in larger systems. Did they succeed in this goal? In my opinion -- absolutely. SMBs that have little to no IT knowledge or infrastructure can easily manage this phone system and perhaps even install it themselves. VARs can also earn margin on hardware, installation, and by managing the system remotely. Although Microsoft is building a strong VAR channel to resell and install Response Point, Microsoft did mention to me one of their goals was to have Response Point IP-PBXs sitting on retail store shelves. Imagine that. Simply head on over to Best Buy or Circuit City, pick up a copy of Microsoft's Halo3 and while you're at it buy your corporation a new fandangled phone system that you can install in minutes. Microsoft Response Point includes several really good OEM partners, including D-Link, Uniden, Quanta Computer, and soon Aastra, who will no doubt be critical to the success of Response Point. Does Response Point have every feature under the sun? No, it doesn't, but it has 99.9% of the every day features you need, makes them easier to use, and it does so at a reasonable price. \nInevitably, Response Point will be compared by some against its big brother Office Communications Server 2007. You can read my take on that comparison here. In brief, I wrote, "My take on Response Point is that it really is designed for the SMB looking for a nice turnkey solution with cool productivity enhancements, such as speech-rec –BUT without the need for all the baggage that OCS 2007 carries – Active Directory, Exchange Server 2007, DNS server, etc. Someone deploying OCS 2007 has a lot of pre-requisites to install – a bit hairy for many in the SMB space – not just the complexity, but the license costs as well." So they are indeed two different animals. I should also point out that OCS 2007 is not an IP-PBX - it is used as an adjunct to an existing IP-PBX, where as Response Point is a full-fledge IP phone system. \nIn any event, Response Point runs on Windows XP Embedded using 100% solid-state memory - no hard drive - so it has no moving parts and therefore has better reliability. Microsoft came to TMC's offices to demonstrate Response Point and to leave the unit for me to test. Microsoft came with the Quanta Syspine model which features embedded FXO trunk ports for connecting up to 8 analog lines. The D-Link model took a different approach by instead using external analog telephone adaptors (ATAs) for connecting analog lines. The D-Link DVG-3104MS is a 4-port FXO VoIP gateway and you can simply stack two together to give you the same 8 ports offered by the Syspine model. \nThe nice thing about this approach is that you can scale as few as 4 analog lines and keep adding more as needed up to a maximum of 50 analog lines. The drawback of course is that you will need network cables run to each FXO gateway, and separate AC adapters to each unit, which will use more electricity. Once you go past 15 analog lines you are probably better off going with a T1 line. \nSpeaking of T1, unfortunately, Response Point doesn't currently support a T1 card in the base unit or within an external T1 gateway. In theory, you could purchase a T1-to-analog gateway to covert the digital T1 signal into analog lines and connect the analog lines to multiple D-Link DVG-3104MS gateways. But that sort of defeats the purpose of a high-quality digital T1 when you convert it to analog. Most SMBs use analog anyway, but an upgrade path to T1 via integrated T1 support should be offered in a future Response Point release. \nSince the phones, base unit, and the FXO adapters all use virtually the same Response Point software (with some customization), you can mix-and-match components across model brands. For instance, you could add a D-Link DVG-3104MS 4-port gateway to the Quanta Syspine (8-port) if you want to expand it to 12 ports. Or you could add D-Link phones to the Syspine unit. Though most customers would likely stick with whatever hardware their VAR/reseller initially sold to them. 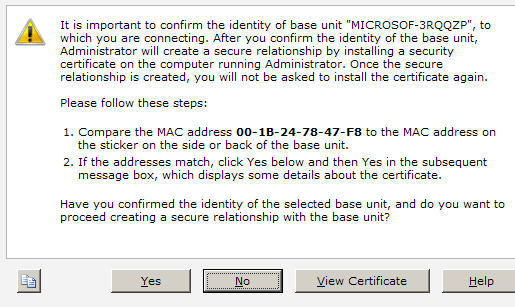 \nAlthough Microsoft demoed the system, I also hooked it up in my lab to see how easy it was to install and configure. My experiences are a mix of the two installations. The first installation duplicated the "out of box" experience any customer, VAR, or reseller would have. Microsoft and I connected the main Syspine Response Point unit along with three Syspine IP phones to a Microsoft-provided D-Link switch (ironic considering D-Link offers a competing Response Point). 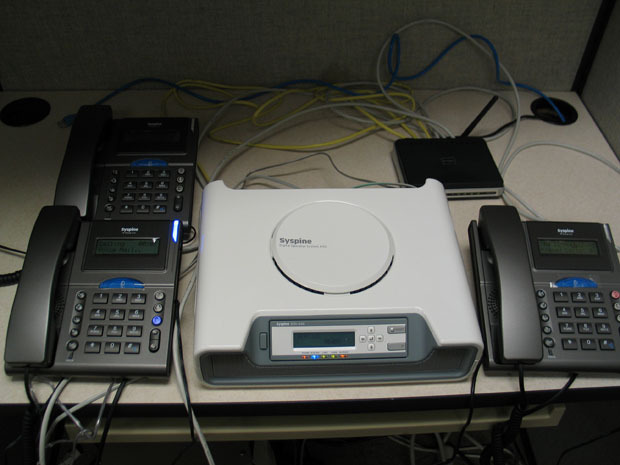 Next, we powered on the Syspine Response Point unit and finally we powered on the three IP phones. The Response Point main unit took about 88s to boot the Windows XP Embedded operating system. 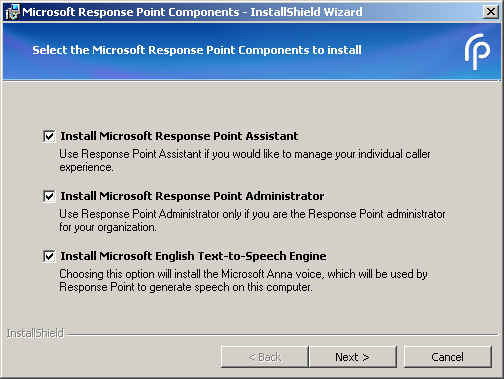 Next, I installed the Microsoft Response Point Administrator and Assistant (softphone-like tool) via the CD, as shown below.